Well, I’m also a most sceptical person. Obviously not the most sceptical person – since you’ve already claimed that title. 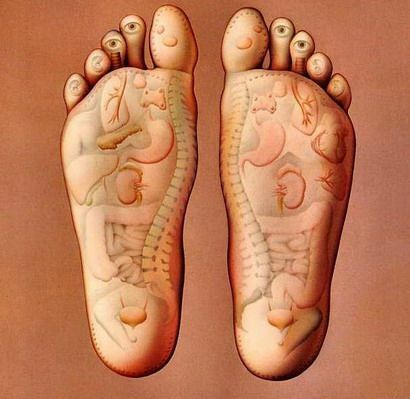 But I still had reflexology (for induction of labour). I don’t think it did a thing for me, for there you go…never say never. Hope it works! If anything, consider it as en enjoyable foot massage. Good luck. Yehudit – My thoughts are that once I’ve exhausted all ‘proven’ remedies I’ll try anything, probably rather like you with your attempt at IOL. When one daughter had a breech presentation I was there leading the way with moxibustion, frozen peas and torches, they failed but fortunately the ECV was successful. I may be a sceptic but I do use aromatherapy in labour, I’m sure that just the distraction and the massage assists a woman with coping just a little longer. I have also been known to use the reflexology points to stimulate contractions when their their frequency and intensity decrease. Vic – It will be good to have the experience and it can’t do any harm. It may be a haematota. I had a shoulder reconstruction and the Consultant purposely did not put a drain in. I think because the Consultant did not want junior staff treating me. I only saw her or in her absence the Consultant Anaethetist a long story an SHO told me the whole hospital medical staff had been phoned by the Consultant about me and what to do in an emergency. Anyway I had a huge lump that throbbed it took weeks and eventually it went away as it was reabsorbed. It throbbed through the tramadol. It sounds like a haematoma to me. hi there, so I have had a chance to catch up as it is the school hols here in Herefordshire, hope they sort out your lump. What is the bit of the body at the heal of the foot on the right,how are those twin boys? Helen – That’s what my G.P thinks it is. It isn’t as painful as your lump sounds, I don’t need tramadol, voltarol and paracetamol tone it down enough for me to potter, it’s mainly bending, lifting and holding babies/toddlers on my lap that cause problems. Princess – We don’t have our holidays until April 6th, this early Easter is causing huge chlidcare issues. I think the bit there is the colon, I’ll ask on Saturday. Those twin boys are butterballs, like their sister! Louis has been rolling over for weeks but Jamie has only just got the hang of it. I don’t think that they are identical now, but people we meet in the street assure us that they are.